KENNEWICK, Washington – August 5, 2013 – Bruker Elemental proudly introduces two state-of-the-art options for its S1 TITAN XRF Handheld Analyzers: a small spot collimator and an integrated camera. The small spot collimator offers enhanced control of the analyzed area, particularly when combined with the integrated camera, by creating a more focused area for X-ray energies. 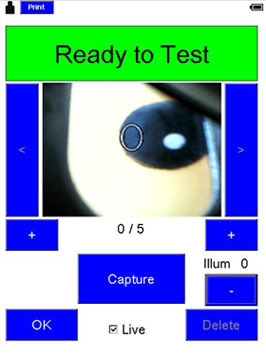 The integrated camera option optimizes accurate measurements to “focus in” on areas of interest. These new options have numerous advantages and increase specificity, ideal for inspecting just the weld seam on a pressure vessel or analyzing just one color on a toy. Save up to five images with every assay. These images create a secure link between the image and the data, integrating seamlessly with the assay results. Such critical measures enable documented confirmation-both analytical and visual-of the analyzed part or material sampled. Easily import the results into a detailed report, combining images and analytical data, with the secure integration of the images. While the small spot technology offers a relatively small measurement area to isolate the tested small features, the accuracy and precision of the measurement and the SHARP Beam feature of the S1 TITAN remain the same as for the "normal" spot. To attain the desired precision, you do not need to extend measurement time. The small spot and camera options are available for numerous, popular Bruker XRF handhelds, including the S1 TITAN LE, the S1 TITAN SP, the SDD-based analyzer, and the Si-PIN-based analyzer. When buying a new unit, order these optional accessories to achieve greater accuracy. The Bruker Corporation is the leading manufacturer of advanced scientific instruments and solutions for a variety of industries, including material and molecular research and industrial and applied analysis. 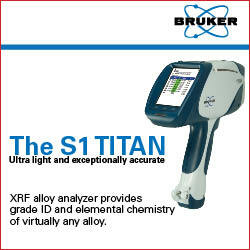 Learn more about Bruker’s comprehensive line of handheld XRF analyzers here: www.bruker.com/s1titan.